Before the monastery of the Annunciation of the Most Holy Theotokos, called Philotheus, half an hour’s walk from Caracal and two and a half hours from Kareia. The monastery stands on a fertile hill, surrounded by gardens and vegetable gardens. At this place in ancient times was located Asklepion. The local temple is believed to have been erected as part of a small cell in the late IX century by Saint Philothe, who lived here with two other monks, Arseny and Dionysius. 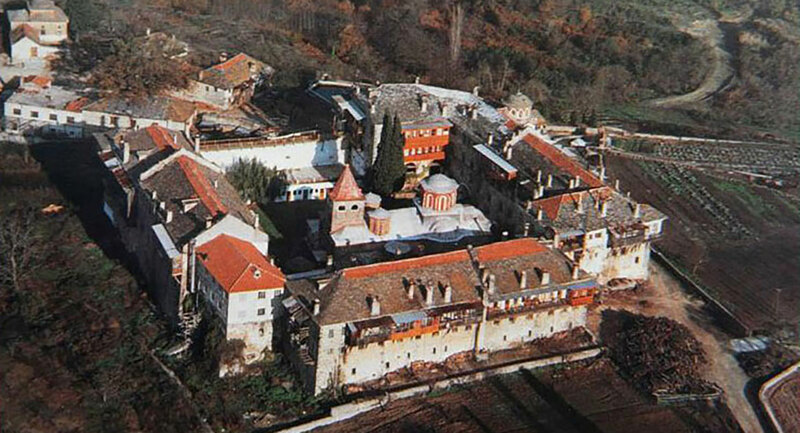 For the first time the name of this monastery is mentioned in the memorandum of Prota Nicephorus of 1015. Further for many centuries, information about the history of the monastery is not mentioned in any document. It is known only that it was supported in due time by the Byzantine and Serbian rulers, and that it was once inhabited mainly by Bulgarian and Serbian monks. 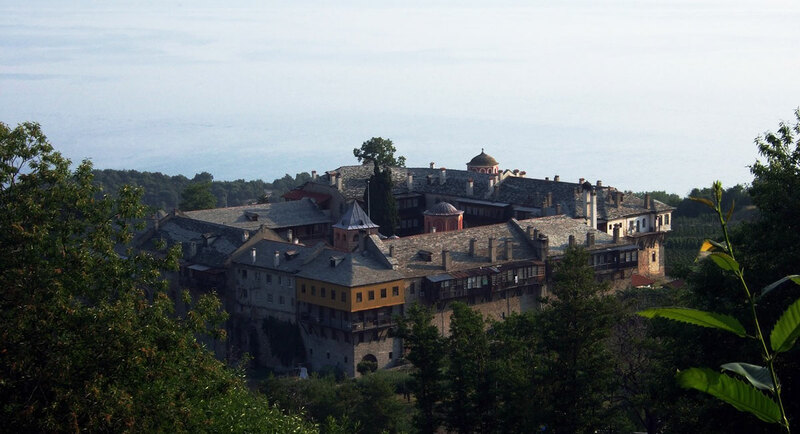 At the beginning of the XVI century, the hegumen named Dionysius expanded the monastery, turned it into a common organization monastery and entered Greek as a liturgical language. This fact went against the wishes of the settlers, the convinced Slavophiles, and they forced him to leave the Holy Mountain. He first settled in Veria, and then moved to Mount Olympus, where he founded a monastery, still called his name. Subsequently, he was consecrated as a saint and now known to us as the Monk Dionysius of Olympia. At the end of his life he returned to the monastery of Philotheus, where he died. 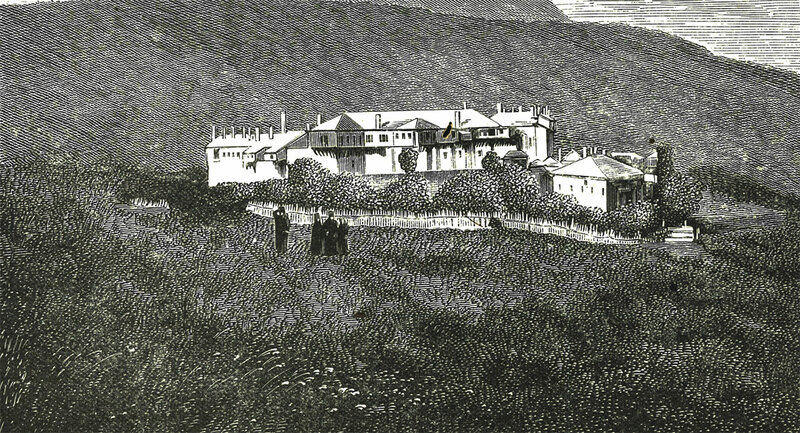 In 1871, almost the entire monastery, except the temple, refectory and library, burnt down in a fire. Since, the brothers are restoring it to the funds of benefactors (mostly Greeks). One of the most famous monks of the monastery of Philotheus was St. Cosmas of Aetolus, who lived in the XVIII century. He traveled extensively in the Greek-occupied Greece at one of the darkest periods of its history, urging the people not succumb to the excessive influence of Turkish culture and try to preserve Orthodoxy by building temples and schools. In 1779 he took a martyrdrom from the hands of the Turks. In the monastery there is a cathedral, built in 1746, nine small temples and chapels and thirteen cells, one of which, in Karey, is dedicated to the holy Cosm Aetolius. Among the many treasures the monastery preserves the right hand of St. John Chrysostom, presented by the Emperor Andronicus II. Among the other shrines are the relics of the holy martyrs Panteleimon, Marina and Dimitry of Thessaloniki, the holy martyr Kharalampos, as well as the miraculous icon of “Glycophilousa” (“Sweet kiss”). According to tradition, it was written by the Evangelist Luke. It depicts the Virgin, kissing the Divine Child. According to the belief, this icon, like Portaitissa, sailed into the monastery along the water. A woman named Victoria, the wife of one of the Constantinople nobles, threw her into the sea, hoping thereby to save her from the iconoclasts. Another miraculous icon, “Gerondissa”, also appeared in the monastery miraculously – she moved here from the Thracian city of Nigrita. Among the shrines of the monastery, in addition to the “Glycophilusa“, the right hand of St. John Chrysostom is stored, the fingers which are gathered for blessing, and the skin and veins are clearly visible and preserved. Here are also stored part of the foot of St. Panteleimon, presented as a gift by Constantine Paleologus, the relics of Saint Marina, St. Isidore, the face of St. Luke, St. Demetrious’s world. Currently, the monastery of Filofei is inhabited by 60 monks.